Background. The use of mesh for laparoscopic repair of large hiatal hernias may reduce recurrence rates compared to primary suture repair. 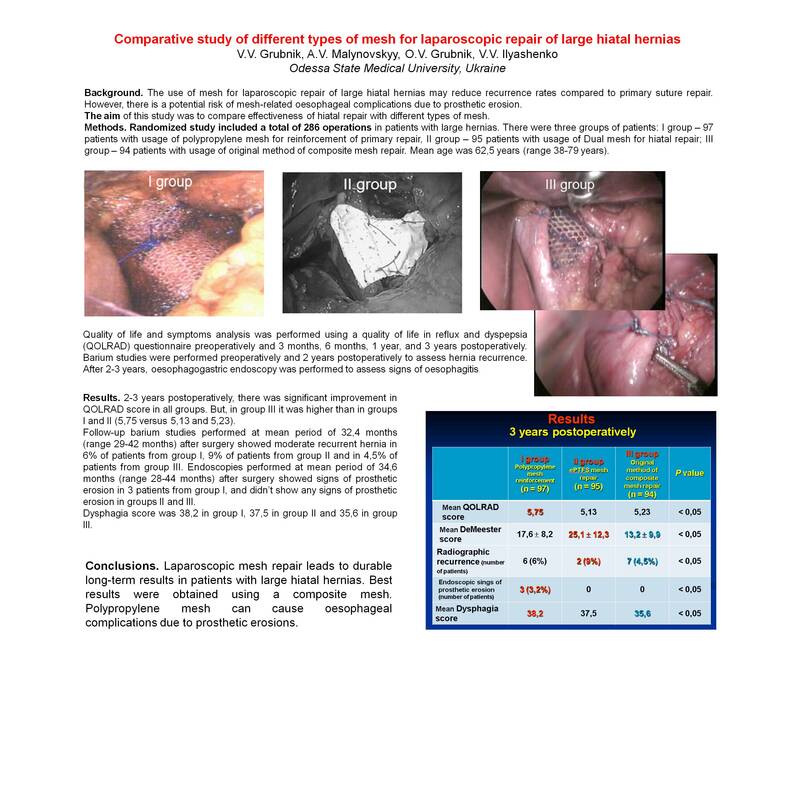 However, there is a potential risk of mesh-related oesophageal complications due to prosthetic erosion. The aim of this study was to compare effectiveness of crural closure with different types of mesh. Methods. Randomized control study includes a total of 286 operations in patients with large hernias. There were three groups of patients: I group – 97 patients with usage of polypropylene mesh for reinforcement of crural repair, II group – 95 patients with usage of Dual mesh for crural repair; III group – 94 patients with usage of original method of composite mesh repair. Mean age was 62,5 years (range 38-79 years). Quality of life and symptoms analysis was performed using a quality of life in reflux and dyspepsia (QOLRAD) questionnaire preoperatively and 3 months, 6 months, 1 year, and 3 years postoperatively. Barium studies were performed preoperatively and 2 years postoperatively to assess hernia recurrence. After 2-3 years, oesophagogastric endoscopy was performed to assess signs of oesophagitis. Results. 2-3 years postoperatively, there was significant improvement in QOLRAD score in all groups. But, in group III it was higher than in groups I and II (5,75 versus 5,13 and 5,23). Follow-up barium studies performed at mean period of 32,4 months (range 29-42 months) after surgery showed moderate recurrent hernia in 6% of patients from group I, 9% of patients from group II and in 4,5% of patients from group III. Endoscopies performed at mean period of 34,6 months (range 28-44 months) after surgery showed signs of prosthetic erosion in 3 patients from group I, and didn’t show any signs of prosthetic erosion in groups II and III. Dysphagia score was 38,2 in group I, 37,5 in group II and 35,6 in group III. Conclusions. Laparoscopic reinforcement with mesh leads to durable repair in patients with large hiatal hernias. Best results were obtained using the composite mesh. Polypropylene mesh can cause oesophageal complications due to prosthetic erosions.